It looks painful. It was. This was a good fast paced 1st period by two fast paced teams. The San Jose Sharks pushed and pursued our Rangers, upping the stakes by upping the pace. They were on us like... well, like sharks. We responded. A Staal Shot from the point was tipped in Drury for his second of the season. Only seconds later, hard work in front of the net would tip another that was waved off after a quick whistle by the zebras who lost sight of the puck then received an earful from Coach Torts. Once the action was restarted, our boys went back to work. A minute later, that work would pay off for Del Zotto who buried a Kotalik rebound and proved it was a good idea for the Blueshirts to keep him rather than returning him to juniors. That two-goal lead wouldn't hold long though, as the Sharks were determined to get back in this game as San Jose's Staubitz charged down the left side and put a puck under a sliding Wade Redden and right through the static Valiquette. Dany "Anywhere but Edmonton" Heatley would stack another goal on for the Sharks as he battled his way through three Rangers (Apparently all 3 forgot how to use their shoulders) on a Sharks powerplay and chip one through Vailquette to tie the game. (The penalty was taken by Redden- For what? Um, I'd tell you but Versus (in typical fashion) chose not to air the replay so there would be more time for another ENZYTE commercial). The momentum would carry through the break and into the second period as an old ghost came back to haunt the Rangers. Jed Ortmeyer (yes, ORTMEYER...the once brave Ranger who would dive in front of pucks like they were $100 bills, but couldn't hit the side of a barn with a shot) found the loose change he was looking front for the Ranger net, scoring a dirty one on Valiquette, who lost sight of the puck and was slow to get across the crease. Another weak penalty called on Marion Garborik for tapping the stick of a Sharks player, posted an immediate return as another scramble in the Ranger crease produced another dirty goal for San Jose. It only got uglier from there as another goal was scored on a 2 on 1 that Valiquette didn't seem quite ready for (turns out he was, but just sucked). 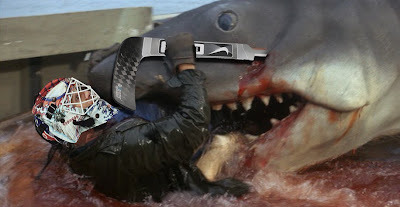 FIVE UNANSWERED GOALS by the Sharks precluded Valiquette (and his rigamortis) being removed from net for the 3rd. Henrik got his warm welcome from the Sharks as they scored their 6th, five minutes into the period as his team abandoned him after making the initial save and leaving opposing players on the doorstep. (After primary offender Dan Girardi cruised into the corner after a "good enough" back check, the Sharks decided to build a fire in our crease, sang a few songs and even had time to roast some marshmallows before tapping in the loose puck.) Later, an Avery drop pass for a Lisin slapper from the side boards would net us a consolation goal and was our last desperate attempt at mustering whatever dignity was left as we prayed the clock would be merciful in ushering in the final buzzer. SCREWED AGAIN!!! The Sharks would get it back instantly as a screened shot whizzed right by Lundqvist. We were indeed got beat at our own game. Our D-men didn't punish any player that tucked his head down and headed straight for our net. Our forwards were battered from pillar to post. While Avery's focus on the game is nice and he picked up his points, tonight is a game where his antics could have given us an edge or equalizer. Maybe the knees a little tender, still? All the digs and cheapshots a big body like Brashear could throw, doesn't mean squat if its thrown after the play on some insignificant nobody or 'knuckle dragger' on the other team. Hit the guy with the puck.. when it counts! There's still one pulsating vein in John Tortorella's head that hasn't exploded yet. But I can imagine he's not done yelling yet, so someone get a mop. Every team has an off night, but our quick start shot that theory all to Hell. We felt the pressure and when we shook it off, they added more and we didn't want seconds. They've shown other teams how to play us... and showed us that we're not as good as our record suggests we are and there's plenty more to add to our game before we start patting each other on the back.